Chilean Metals Inc. (TSXV:CMX, OTCQB:CMETF, SSE:CMX, MILA:CMX, FRA:IVV1, BER:IVV1) is pleased to announce the assay results from two historic drillholes at the Trident prospect at Bass River in Nova Scotia. Core from two historic holes drilled in 1987 at the Trident prospect was located at the Department of Natural Resources core library at Stellarton. The holes were drilled to test a subcropping magnetite occurrence. The entire length of the holes was resampled by Chilean at 1m intervals and assay results have now been received. The holes were very shallow, being 39.9m and 36.6m deep respectively and were angled at 45o. The collar locations of the holes are approximate as they have been scaled off a historic map. Cobalt mineralisation commences immediately below the base of overburden in both holes. The holes intersected a mafic quartzite which has been flooded with magnetite and disseminated pyrite. This unit hosts the Cobalt mineralisation and appears to be dipping steeply to the south. Both holes terminated in a barren metasediment. 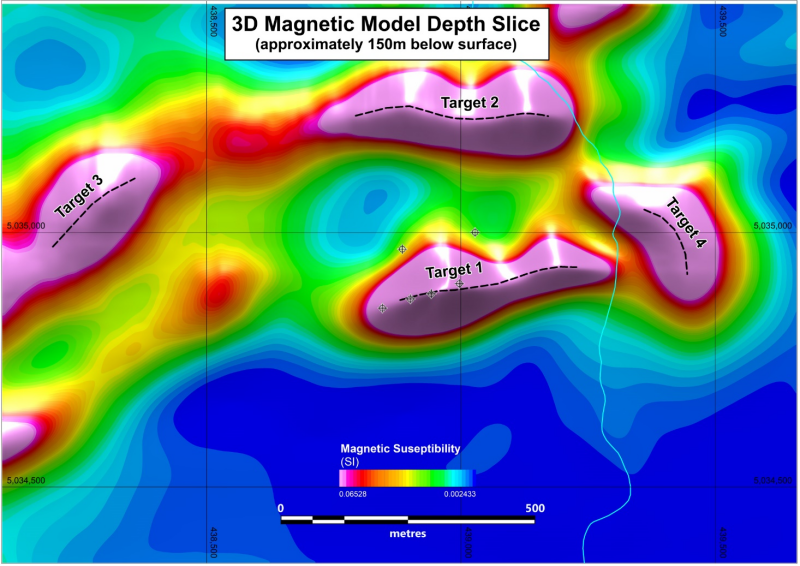 Given the observed correlation between intense magnetite alteration and Cobalt mineralisation magnetics is considered a primary tool for target identification and mapping. Data has also been received from the recent, very detailed helimag survey over the Trident prospect. This data has been modelled in 3D and a north-south section through the model at 438925E is presented. Two large, intensely magnetic bodies are apparent on the section. The historic drilling appears to have intersected a small apophysis protruding from a significantly thicker magnetic body labelled Target 1 whose southerly dip is consistent with field observations. A depth slice through the 3D magnetic model is also presented which indicates that the magnetic bodies have significant strike length. Mick Sharry, President and COO of Chilean Metals commented as follows : “We are very pleased and encouraged by both the assay results from the historic drill core which shows that we have a Cobalt mineralising system present associated with strong magnetite alteration and the results of the 3D magnetic modeling which indicate the very significant scale potential of the magnetic bodies. The cumulative strike length of the interpreted magnetic bodies is 1,100m and the model indicates significant depth extent as well. So we have both grade potential and tonnage potential. We are committed to driving these projects forward and building value for our shareholders. 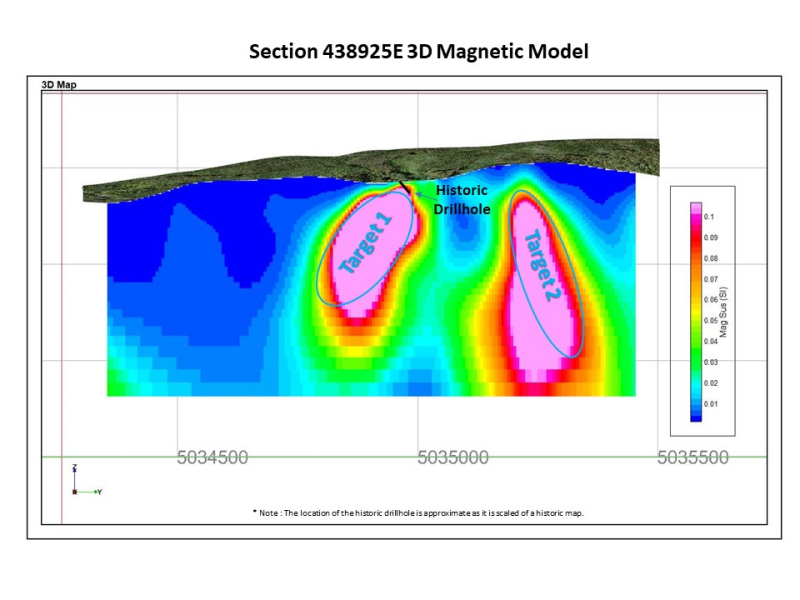 The next step in that process is a 3D IP survey at Trident to map the spatial distribution and intensity of the pyrite mineralisation which contains the Cobalt. That will commence over the next few days. Once we have that model, all available data will be combined to define multidisciplinary drill targets and we will move to drill test those soon after.